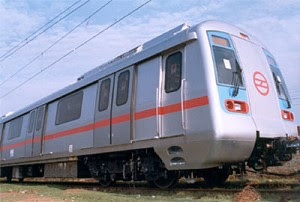 The metro now connects some parts of NOIDA (UP) and Gurgaon (Haryana) and will soon be racing towards the Delhi Airport. In addition to the other important landmarks of the capital, the Railway Stations – New and Old have already been connected. It was a pleasure and a surprise to witness the progress of the metro. As they built, DMRC (Delhi Metro Rail Corporation) progressively made improvements too, in its style and pace of functioning and constructing, learning from their previous (construction) experiences and also mistakes and lapses, if any. Thus, construction became faster as each part was completed. It is also to be mentioned the manner in which the constructions were conducted with the highest degree of discipline, order and cleanliness. While DMRC epitomized punctuality, stuck to its deadlines and completed its task on and sometimes even before time, stray accidents here and there marred the journey hampering the progress of work (e.g. NOIDA, Punjabi Bagh line) and at times incurring the ire of the general public too. I vaguely recollect the details of one such accident wherein a few labourers were either crushed to death or badly mutilated/injured and another perhaps included the road commuter(s) as well who also met similar fate. In two instances, if I remember correctly, it was the crane lifting the concrete cups for fit, lost grip, causing the heavy cups to crash down on hapless traffickers or workers who happened to be underneath at that spur of the unfortunate moment. This gave rise to various (public) speculations and media sensations like DMRC was buckling under tremendous pressure of meeting its pre-fixed targets and that these were the evidences of self-imposed stress borne out of rigid adherence (stipulated by DMRC Chief, Mr. Sridharan, a strict disciplinarian and a man of his words) to sincere but impractical timelines promised to the Government and the masses and DMRC’s insatiable desire to prove that they were the best etc. etc. Resultant – hurried, callous attempts to finish the work. DMRC spokespersons, on each such occasion, either furnished explanations (a tad apologetic at times), wherever the cause could be easily discerned, or assured enquiries into the mishaps stating that they would revert with the report, once the investigations were concluded. But why dwell upon the gloomier aspects of a heritage in the making? Running the risk of sounding brusque, it might as well be pointed out that enormity of tasks always entail a certain quantum of pitfalls. The reasonability and justifiability of such shortcomings shall always be under the scanner. Nevertheless, it’s almost like an axiom of history which may or may not have been recorded or deliberately overlooked time and again by the data collators. But yet fact remains that jobs of massive proportions, voyages of boundless encompass, revolutions of overhauling dynamism have always been undertaken and completed on human sacrifices and travails. It is the commoners - the unsung, unspoken of, obscure men of non-repute, who have always paid heavy prices in creating and re-creating civilization and invariably history chroniclers have carelessly excluded their unrewarded contributions (!) from the pages of time. Men who lost their lives in these accidents taught the men at work what not to do and where to be more cautious. It is said that the Mughal emperor, Shah Jahaan, engaged approximately 500-600 workers per day (or perhaps even more, 20,000 being the total number) of high repute and craftsmanship, who converged from different parts of his kingdom and outside, for building the Taj Mahal. Just imagine the employment generated by the exquisite construct! But at the same time, the phenomenon saw an artificial famine as the emperor diverted bulk quantity of food grains, for feeding the craftsmen at work, which was otherwise meant to be distributed around whole of his kingdom*. History does not enlist the names of those men, women and children who lost their lives in the famine in order to give birth to one of the flawless wonders of the world!!!!!!!!!!!!!!!! !